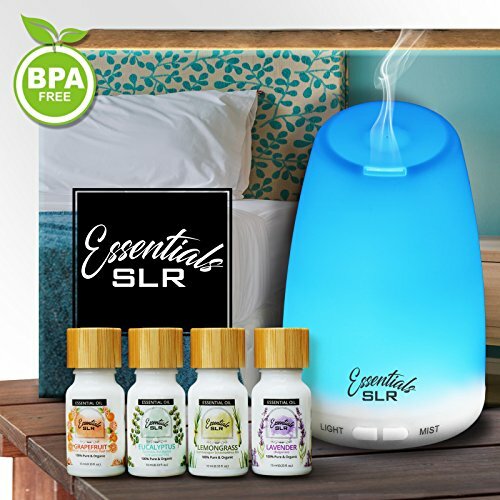 Introducing The Small Multi-Color Diffuser from SLR Essentials plus Relaxation Pack!! Our SLR Essentials diffuser comes paired with four 10ml jars of uniquely soothing oils from our Essential Oils Collection. Our Relaxation Pack, comprised of our globally sourced Moonlit Eucalyptus, Grapefruit Sunrise, Hidden Lavender, and Lemongrass Dusk essential oils, restores your inner balance while facilitating a steady, calming unwind. More than just an enticing combination of herbal, minty, floral, and fruity aromas, these oils are powerful natural remedies that alleviate the mental and physical stress sustained through life’s rigors. All essential oils included are pure and certified organic.